On 22nd June me, my Mum and my friend, Kirsty are doing the Race for Life in Hylands Park, Chelmsford. Obviously, I wont be running it because I am WAY too unfit for that, so I'm going to walk it!! I would be SO grateful if you could sponser me, even if it's just £1. Also, if you want to sign up and do the Race for Life yourself then go to http://www.raceforlife.org.uk/ - it'd be great if I could see some of my blog readers at the Hylands Park one too! One of my blog readers, Rosie & I have made an arrangement! Rosie is going to make a notebook (which is guarenteed to be amazing, I have one myself!!) for a raffle. 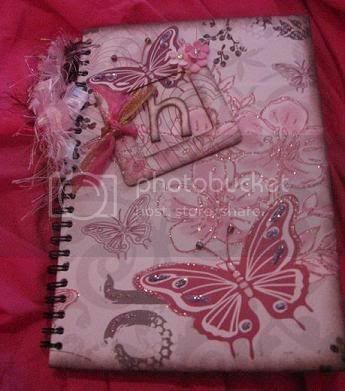 Basically, who ever sponsors me (£2.00 or over) will go to Rosie's blog, leave her a comment and then in the end she will randomly choose someone and they will win the notebook! Sounds like a good idea, yes? So come on guys...do it do it do it!! Edit Here's the notebook that Rosie made for me. I absoloutly love it! ..it's all for a great cause and i'm glad to be 'walking' it with you! ps. remind me to buy extra plasters! Hayley (and mum of course!) Well done on doing the Race for Life. I've sent you an email Hayley, can you reply? Also I've added up a post on my own blog with a link to you here. Hopefully this will generate some more sponsorship for you. Hi Ya Brave Girlie,I think its time to raid old codgers piggy bank for your sponser.Will be right behind on this one,good luck to your mum and friend,dont forget to take a nice pair of comfy slippers for the finish line!!!!!!!!!! Have just had a good snout around your blog, I'm one of Rosie's friends (well, she called me names and slapped me on Saturday, but I think I'm her friend) just wanted to say hi really, and that you're amazing, the pic of your little neice (is that who it is?) is gorgeous, you forget they are ever so tiny! I bet loads of people will go for your raffle for Rosie's notebook, and if they don't then I will tell you now it'll be FAB cos she's amazing! It's Gorgeous Hayley -'ve seen it for real and was very jealous!!!! Rosie is a talented young lady!! Listen to you lot! If my blog and notebook gets Hayley sponsorship, then I can't wait to make a second one! I've added a couple of photos of it (including a close up) on my blog and also of the co-ordinating card that I made too.